I read a great deal of comics. Most of the time I read my weekly books and walk away being angry, or just really confused. After reading this issue of Superman Family Adventures I felt something I haven't felt in a long time. I, dear reader, was entertained (which you may or may not be when you read my post on this site). I really wished that each and every comic that was put out gave me this feeling but no. The art is so simple along with the story that it's a totally awesome marriage. Which doesn't even need a pre-nup. Sometimes simple is the best way to go. This book is fun because it's also so damn goofy. It's got Titano who is a pet of Lois Lane. Titano finds some red krytonite and grows into a raging powerhouse, who after reading this issue looks a little bit like King Kong. I hope DC Entertainment has it's lawyers ready. Clark Kent pals around with Bob Kent. Who's Bob Kent you ask? 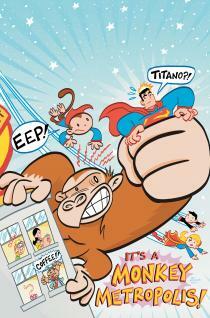 Why it's just the civilian identity of Beebo the super monkey. It's a monkey paling around with Clark totally wearing a tie and glasses. That was worth the cover price alone. The look on Lois's face when she hears that Bob needs to wear glasses (cuz he's a Kent Dammit) is pretty funny. You get the feeling that she knows that Clark is Superman but for the sake of the book she stays quiet. Anyway back to the story. Titano eats the Red Kryptonite and grows all big and starts making trouble around Angel Grove, I mean Metropolis. Big Blue shows up and gets exposed to the Red Kryptonite and splits into two different beings. The Evil Superman is Clark Kant. As in he can't and won't do a dang thing to help you. It's true, he'd rather spend his time trying to mack on Lois and not shaving his five o'clock shadow. Boy he sure is a jerk. But I do like his all white Superman outfit. Anyway Beebo saves the day and removes the Red Kryptonite and rejoins the two Supermans (Supermens?). Also I like how there is a very cool joke in the back. See since this is an all ages book the younger readers are allowed to send in drawings of the Superman family and tons of kids do. Which is all fine by me, but someone sends in a drawing of Krypto and Streaky the super cat. The child's drawing has word balloons added by the editor. Krypto is talking to the reader and Streaky is all like "Dude, shhh." Because you know, the super pets don't talk around humans. A great book that leaves you with a great feeling. Hey Johns and Bendis you could learn a lot from this book. Wait this just came in, Bendis is taking over this book. It'll be retooled to Somewhat new Superman Family Adventures to the MAX. Across 70 plus issues, Superman and the crew try to figure out how to put on his snazzy new non red underwear suit.